If you live in a sloped area, you need retaining wall to hold the pressure from the higher soil. Choosing the right retaining wall ideas not only provide protection, but also decorative elements for your house. They can be rustic, elegant, or modern, depending on your preference. You can also build them with bricks, concretes, wood or steel. This guide will help you create the best retaining wall that matches your home design. This wall holds the load from higher soil solely using its own weight. There are no force vectors that help to hold the wall against the push of the soil. This type of wall is common, but it can easily break or topple, especially when the soil weight gradually rises (such as during rainy season). This wall is placed firmly in the ground by adding extra soil on the front side. This means the soil acts as the opposing force from both sides, holding the wall in place. This wall uses an extended part at the bottom that reaches to the higher soil’s side. The extension acts as a lever that helps to stabilize the entire structure. The bottom part of the wall is usually built wider for extra balance. This wall strengthens its own position by having a cable and anchor to hold it in place. The anchor is embedded deep into the higher soil, which helps to stabilize the wall against the soil push. You can combine this wall type with other styles, such as cantilever or piling styles. All retaining walls must have strong base and balanced structure, which give them advantage when holding the soil load. After determining the structure, you can start thinking about the materials. The timber retaining wall provides a farmhouse-style look that is perfect for a backyard garden. You can create a vertical “fence” or horizontal wall panels to complement a vegetable garden, flower bed, or lawn. If you aim for a lighter look, choose wooden planks or plywood instead. 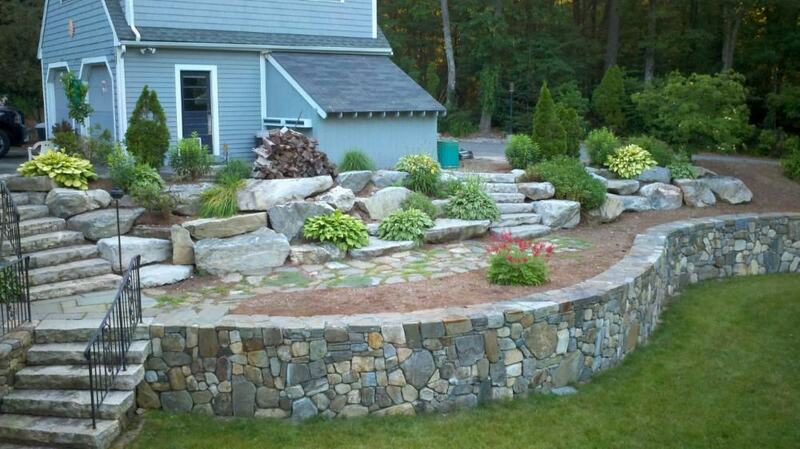 Using giant stones or rock boulders for a retaining wall will create rustic, fort-like look. They are strong, able to withstand elements, and provide natural beauty without too many frills. You can pair them with backyard flower or vegetable gardens. The concrete retaining wall is perfect if you need extra protection against the soil load. Some people don’t like concrete because of its “flat” look, but you can pair it with perfectly-maintained lawn or landscaped garden for a modern look. Bricks are classic options for a retaining wall. The vintage-looking brick retaining wall will add classic elegance in your backyard. However, you need to regularly maintain its surface, since moss can easily grow over time that weaken the structure. Brick walls are ideal for areas with minimum rain. Retaining walls that are fully made of steel are rare. However, steel is perfect as an addition, which you can combine with other material. Retaining wall steel element often appears as a strengthening element (such as soil spikes) or unique decoration. Remember, when choosing retaining wall material, always put strength and adaptability over look. You can determine the best wall look after choosing the right construction and material. Build a strong, horizontal sleeper retaining wall with stacking method. It is perfect to create a short wall, but if you want to hold soil from higher ground, switch to horizontal. Bind the sleepers together with wire or metal strips. Double retainers use two wall layers to create dimension and additional space. The front wall is usually shorter, with extra space between the walls to create planters, for example. The double walls may consist of slightly different materials, such as grey bricks and horizontal slates. Circular or curved walls are perfect for uneven terrain. You can build them out of different materials, but the most common ones are stones and concrete. Boulder rocks are perfect to create curved walls without special technique, thanks to their massive and uneven shapes. Retaining wall blocks are usually made of stones, either smooth slabs or textured blocks. They create strong, massive look that can be eye-pleasing depending on the textures. If you only need a short wall, you can experiment with multiple materials. For example, you can create a combination of wooden planks, rocks, and wire mesh to create the farmhouse-style look. Gabion style (the combination of mesh cage and heavy materials) is perfect to reduce erosion effect and increase structural integrity. Regardless of materials, a retaining wall must be properly maintained to ensure its strength. You must pay equal attention to the front and the back side of the wall, since people often don’t pay enough attention to the back. Check for any cracks, holes, low surfaces, erosions, and “pool”, which indicates moisture problem. Avoid the growth of weed and moss on both surfaces of the wall. If you let them, they can overwhelm the structure and weaken it, especially if the walls are made of bricks or wood. If you live in the four-season country, use salt (NaCl) to remove snow buildup from your wall. Using harsh chemical substance to remove snow can damage your wall. Retaining wall provides protection against soil damage, but it also makes your property more beautiful. Always remember to choose the correct structure and style based on your ground characteristics. You can choose retaining wall ideas after establishing the correct design and structural integrity of your design.